i saw this ad on top of the jeepney next to what i was. it said: Judgement Day May 21, 2011. The Bible Guarantees it. errr. that is a bit odd and i told myself to make a blog about it. i forgot and i am writing about it now. 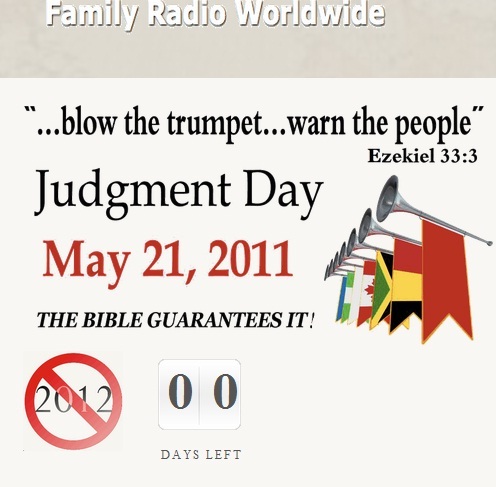 so as i researched online FamilyRadio started this errr deadline. they claim that it was written down. today will be the judgement day for all of us as they say those who are not saved will be for a lack of better word: annihilated. so if today was the rapture and that i am not saved, i do hope when i get to heaven they have super fast wifi connection.